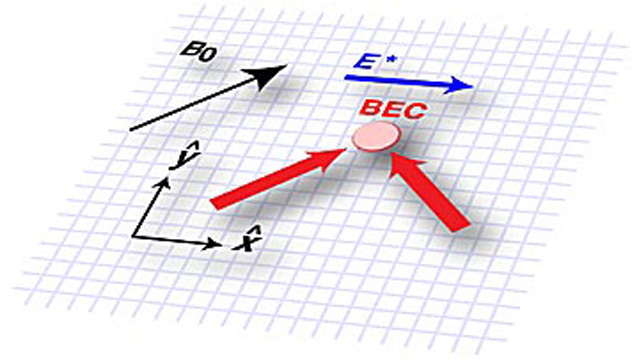 The researchers create a synthetic electric field (E*) in an ultracold gas of several hundred thousand rubidium atoms (BEC) immersed in a constant magnetic field (B0). Using lasers (red arrows), the team alters the atoms’ energy-momentum relationship, which causes the atoms to move in a way that is physically identical—and mathematically equivalent—to how a charged particle would move in an electric field. Completing the story they started by creating synthetic magnetic fields,* scientists from the Joint Quantum Institute (JQI), a collaboration of the National Institute of Standards and Technology (NIST) and the University of Maryland, have now made atoms act as if they were charged particles accelerated by electric fields. Reported in the journal Nature Physics,** these synthetic electric fields make each atom in a gas act, individually, as if it were a charged particle, but collectively they remain neutral, uncharged particles. This dual personality will help researchers simulate and study fundamental electrical phenomena and may lead to a deeper understanding of exotic phenomena involving charged particles such as superconductivity, the flow of electricity without resistance, or the quantum Hall effect, used by NIST to create a standard of electrical resistance. Some aspects of electricity are difficult to study because, although oppositely charged particles are attracted to one another, similarly charged particles are repelled by one another. To get around this, NIST physicist Ian Spielman and his colleagues realized that they could make atoms, which are typically electrically neutral, act as if they are charged particles in an electric field—extending their earlier method for making neutral atoms act like charged particles in a magnetic field. The researchers create their synthetic electric field in an ultracold gas of several hundred thousand rubidium atoms. Using lasers, the team alters the atoms’ energy-momentum relationship. This had the effect of transferring a bit of the lasers’ momentum to the atoms, causing them to move. The force on each atom is physically identical—and mathematically equivalent—to what a charged particle would feel in an electric field. So while the neutral atoms each experience the force of this synthetic electric field individually, they do not repel each other as would true charged particles in an ordinary electric field. This is analogous to an experienced group of dancers all following the moves of their instructor without getting in each other’s way. According to Spielman, this work may enable scientists to study the Hall effect, a phenomenon where an electromagnetic field can cause charged particles traveling through a conductor to experience a sideways force, which has of yet been unobserved in cold-atom systems. The work may also facilitate measurements of the atomic equivalents of electrical quantities such as resistance and inductance. For neutral atoms in synthetic electric fields, inductance is a measure of the energy that is stored as a result of the atoms’ motion, and resistance is a measure of the dissipation, or energy loss, in the system. Measuring these quantities could provide insights into the properties of charged particles in analogous systems, including superconductors. * See “JQI Researchers Create ’Synthetic Magnetic Fields’ for Neutral Atoms,” Dec. 15, 2009 below.